Landlocked Malawi is full of surprises. In the heart of the continent John Spence discovers some of Africa’s finest beach destinations. The turquoise pan-flat waters stretched on every side. The beach on Lake Malawi was of the softest golden sand and I’d just finished snorkelling among shoals of kaleidoscopic fish. A wooden fishing boat, its sails patched out of countless mismatched fabrics, creaked its way past close to shore and its skipper raised his hand in a lazy wave. I walked back to my cottage, which was hewn from a granite headland. With its furnishing hand carved from local wood, simple but also quirky and stylish, elegantly comfortable in the tropical heat. I could have been in one on the Indian Ocean’s more exclusive island hideaways but I wasn’t. The water clarity far exceeded any you’d find in the ocean.There was no salt to wash off my body and the atmosphere was somehow even cooler. A touch more exclusive. I was on Likoma Island in Lake Malawi. This island was first settled by Europeans at the end of the nineteenth century by Scottish missionaries, who made this their base to convert Nyasaland. In 1903 they built a huge cathedral, the largest in Africa and on the same scale as Westminster Cathedral. But there is no longer a Nyasaland and this tiny island never became the heart of a greater Christian empire. It has slumbered along for the last hundred years, living off lake fish. Cut off from the changes that have affected mainland Malawi and insulated from troubles across the border in Mozambique. The mighty cathedral is still in use, but even at Christmas the population of the island would struggle to fill its aisles. Their hymns echoing faintly from its vast tin roof. There’s no need to wait for a service to mingle with the locals. As there are plenty of smiling faces in the island’s only bar, by the market in the main settlement, that sells ice-cold bottles of ‘Greens’, the local beer. With its friendly fishing villages, cultural heritage and superb beaches and diving I really thought Likoma Island would be the highlight of my visit. But even better was to come. A 20-minute speedboat ride took me to Combue Village in Mozambique. Surely one of the sleepiest border crossings in the world. With its chickens wandering in and out of the customs post and a church pocked with hundreds of bullet-holes dating back to the civil war. 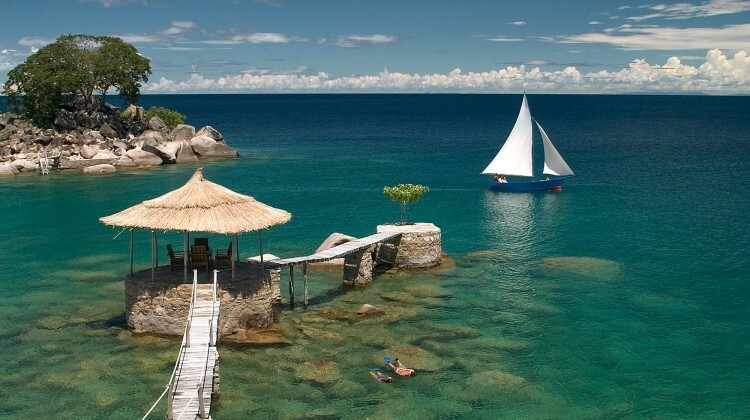 The language was Portuguese, Lake Malawi’s name changed to ‘Lake Niassa’ and the atmosphere slowed from laid back to almost comatose. An official waved a stamp over my passport and I was free to speedboat another 25 minutes to Nkwichi Lodge. 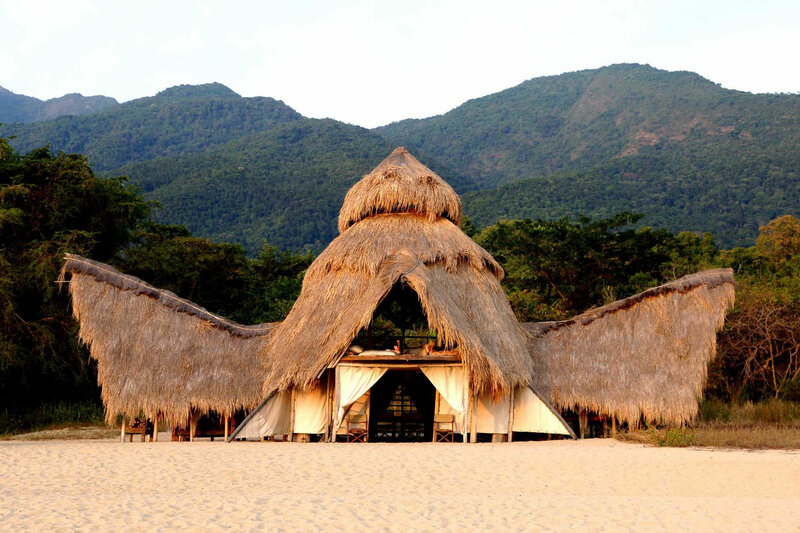 Set on a broad beach of white sand so fine it squeaked, with beautiful views over the lake as the sun set over Malawi’s layered hills. Unobtrusively owned and run by Patrick and Wendy, it beautifully combines the beach focus of a Seychelles island with something very much more African. The friendly staff who seem really happy in their jobs and the chance to practice their English. The guides who explain the region’s history and the recent memories of Mozambique’s civil war, and a huge baobab tree 29 metres in circumference. Apart from diving and snorkelling, canoeing is an excellent way of exploring the coastline. Canadian canoes can be borrowed, with or without a Nkwichi paddler providing power from the rear, and you drift past the bush with occasional sightings of villages and wooden fishing vessels. With no crocs, hippos or river currents to worry about this would be suitable for any age of traveller, and I’ve put it on my list of things to do with my family. Back in mainland Malawi I drove to Liwonde National Park. Four hours travelling through classic African countryside through villages built from reeds and packed mud and overtaking bicycles wobbling by carrying wardrobes of produce of half a field on the back. Liwonde National Park is set around the Shire River. Where there are elephant and hippo, crocs everywhere and thousands of birds. The park has no big cats, buffalo or giraffe. And with Zambia so close it is never likely to attract keen wildlife watchers, but the birding is superb. Mvuu Lodge, tented on the edge of a lagoon, is a lovely place to spend a few days, travelling up and down the river by boat and enjoying the atmosphere. I next flew up to Nyika Plateau, 2,500 metres above sea level. The drop in temperature was quite a shock but rooms warmed by wonderful log fires were a pleasant surprise. The landscape was transformed into a moorland of pine forests, fern bracken and flowers. For a moment I felt as if I’d been transported to the Scottish Highlands but for the eland, roan, bushbuck and reedbuck dotted around the countryside. Walking, trout fishing and mountain biking are the main activities here. 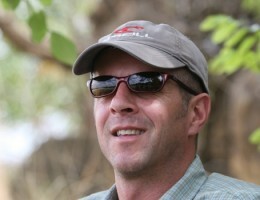 There are also day and night game-drives where the wildlife sightings are generally limited to antelope. But there is plenty of special plants and a myriad of birds to see. I also visited Vwaza National Park, an overlooked oasis for elephant clinging to the edge of a tiny tourist industry. Game-viewing was in a clapped-out Land Rover missing its windscreen and most of its body panels. But it was a welcome step away from the increasing sophistication of the safari experience elsewhere. 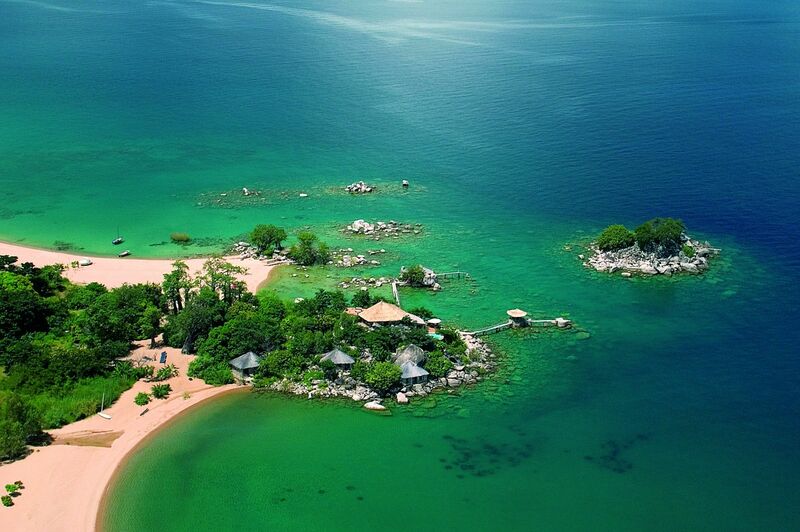 Most visitors to Lake Malawi stay just a few days, adding some time on a beach to a Zambian Safari. It’s easy to get to the Lake from Zambia – travel time is around half a day – and there an excellent opportunities to relax, dive or canoe in the area. The rest of Malawi, however, has plenty more to offer. 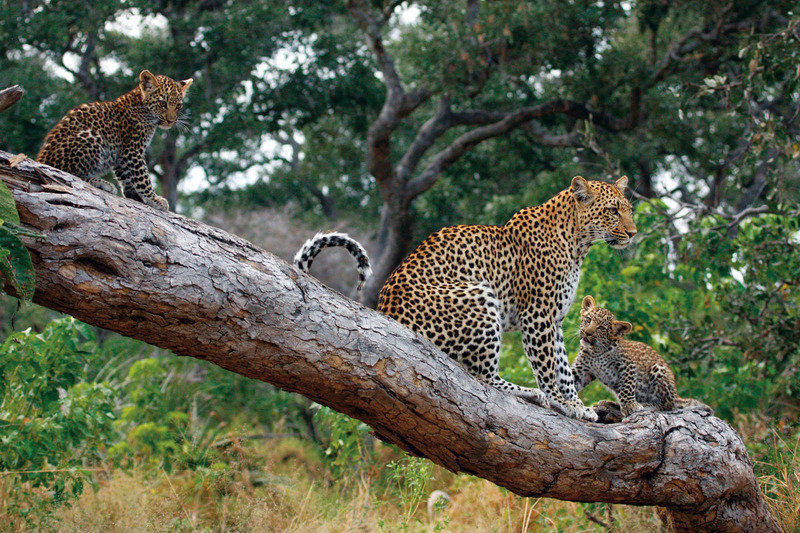 It doesn’t offer the wildlife of some of Africa’s other destinations so it isn’t suitable for first-time safaris and it can’t provide high-concentration game viewing, but it does offer a captivating glimpse of rural Africa at its most unaffected and engaging, a friendly and unspoilt country where tourism is a novelty and the sight of a vehicle – let alone a safari vehicle – often inspires awe. It also offers some of the best beaches and beach lodges I have ever stayed in. Forget the Indian Ocean. The next time I take my family for a beach break it will be to Malawi.